Barnegat Bridal Boutique is located in a quaint home-like environment. Our customers enjoy personalized, non-pressured, professional service. Our spacious dressing room allows our customers to feel special as they are able to walk around and view gowns from various angles. Our front room with a tri-fold mirror allows our customers to show a gown to family and friends. We believe every customer should enjoy the time-honored tradition of this special even in her life, whether it is the bride, the mother-of, bridesmaid, or someone celebrating an anniversary or special birthday celebration, etc. Our special occasion dresses and wedding gowns are priced to meet every budget. We also have accessories, including shoes and purses to compliment the dress. Sharon Hoffman wearing a Matthew Christopher wedding gown. I was able to buy a sample dress for a VERY reasonable price. Seamstress that was recommended did a great job on my french bustle as well. No one at my wedding would have guessed that the dress I had so many compliments on was so affordable! We have several racks of discontinued designer gowns including Ines di Santo, Matthew Christopher, Carmela Sutera, etc. that are now 50% off. Many of the gowns are like new. Great deals! 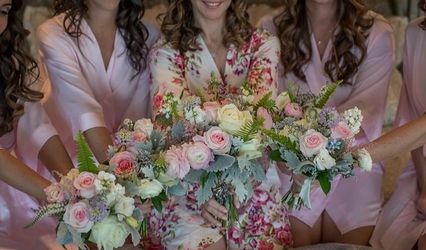 When ordering 5 or more bridesmaid dresses at Barnegat Bridal Boutique you will receive a 10% discount off all the dresses. 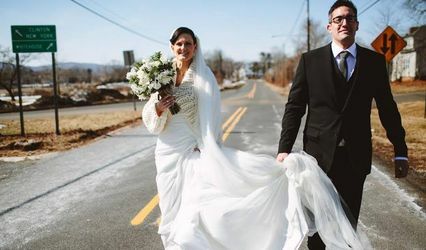 Barnegat Bridal is a hidden gem kind of a shop - one you&apos;re happy you were able to find! In the myriad of bridal boutiques, Donna&apos;s service and attention to detail stands out. I&apos;ve worked with many brides who have purchased their bridal gowns, or attendants&apos; or mother&apos;s dresses from her, and all have come away with a personal experience, and beautiful alterations from her seamstress. Her gowns are lovely, and she&apos;s a pleasure to work with - I&apos;d highly recommend Barnegat Bridal for your special occasion & bridal attire!